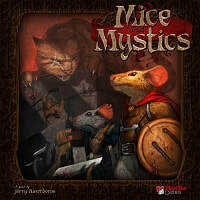 Mice and Mystics - In Mice and Mystics players take on the roles of those still loyal to the king – but to escape the clutches of Vanestra, they have been turned into mice! Play as cunning field mice who must race through a castle now twenty times larger than before. The castle would be a dangerous place with Vanestra's minions in control, but now countless other terrors also await heroes who are but the size of figs. Play as nimble Prince Collin and fence your way past your foes, or try Nez Bellows, the burly smith. Confound your foes as the wizened old mouse Maginos, or protect your companions as Tilda, the castle's former healer. Every player will have a vital role in the quest to warn the king, and it will take careful planning to find Vanestra's weakness and defeat her. Mice and Mystics is a cooperative adventure game in which the players work together to save an imperiled kingdom. They will face countless adversaries such as rats, cockroaches, and spiders, and of course the greatest of all horrors: the castle's housecat, Brodie.